A while ago, I wrote that I was planning on taking Boyfriend to Fiji sometime. Well, there have been some developments since then! We’re getting married in Fiji! We wanted something relatively low-key that gave us an opportunity to be “us” and Fiji is perfect. 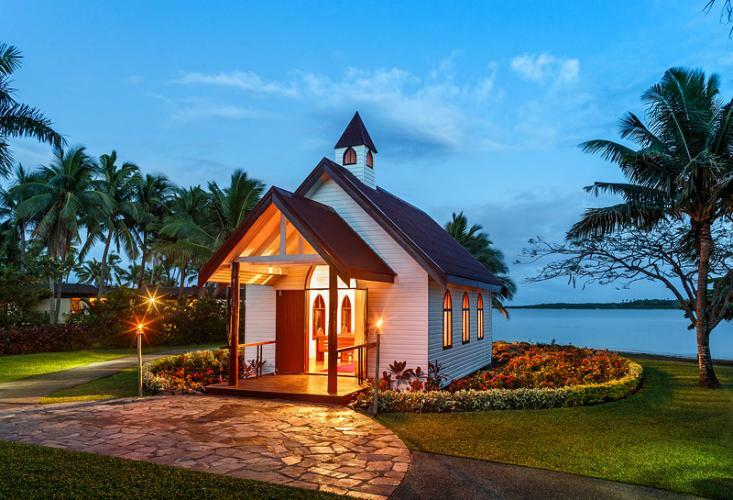 Our little white chapel on the beach also gives us the perfect compromise between the church wedding I want and the beach wedding Fiancé wants. Planning it is sometimes hard, confusing, frustrating and all the rest… All I want is to stand in front of the people who matter most to me and tell everyone how much I love him, and for them to be there with us as we promise our lives to each other. I don’t care about the details! I know it will be magic, and the countdown is on. I can’t wait! here it is – where we will be getting married!